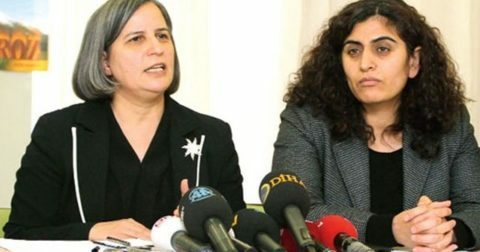 The sixth hearing in the trial of Gultan Kisanak, co-mayor of Dyarbakir, and Sebahat Tuncel, co-leader of the HDP-affiliated DBP, took place on 3 November. It was attended by freelance journalist and editor John Hunt, as a UK observer. The hearing was held in Malatya, 150 miles from Dyarbakir, and the two defendants appeared by video-link to Kandira maximum security prison, 620 miles away, where they’ve been held for a year on charges for which the state demands more than three hundred years imprisonment. “So far I have only made a general defence”, she told the court. “I haven’t used my rights to defence yet. I want to appear in person and present my defence case by case”. There are essentially three components to Ms Kisanak’s indictments: speeches and statements she allegedly made, mainly at public events such as Newroz celebrations; eight alleged visits to the Democratic Society Congress (DTK) headquarters. for which she is charged as “director of an armed organisation”, although at the time the DTK was invited to submit proposals to a Turkish parliamentary commission on constitutional reform; and charges for lawfully allowing municipal vehicles to carry the bodies of PKK fighters from the morgue to cemeteries for burial. Sebahat Tuncel’s indictments also focus on her speeches, along with the claims of an anonymous witness who has yet appear in court. She urged the judge to show courage in upholding the rule of law and her democratic right to oppose the government. Ms Kisanak was detained at the same time as her Diyarbakir co-mayor Firat Anli, but by different police forces and on different charges. Her lawyers say this proves that these are political prosecutions. “In Dyarbakir, a city of two million, the elected representatives have been replaced by a commissioner appointed by the state”, Ms Kisanak told the court. “Without local democracy there can be no democracy”. “After the trial I met with Dyarbakir’s deputy mayor Serra Bucak”, said John Hunt. “She explained that the commissioner has banned the elected councillors from meeting and reversed the municipality’s reforms, especially on women’s rights. She urged UK mayors to back the ‘Mayors For Mayors’ campaign and actively support Gultan Kisanak and all the jailed Kurdish mayors by applying to visit them and other forms of solidarity”.